The Ashkenazim are certainly of Turkic Mongolian origin, same as the Yakut, and both are horse-riding nomads. The raids of Turkic Mongolians using horses expanded their invasions to the west and south to Rome and India. Collectively, Ashkenazi are less genetically diverse than other Jewish ethnic divisions. 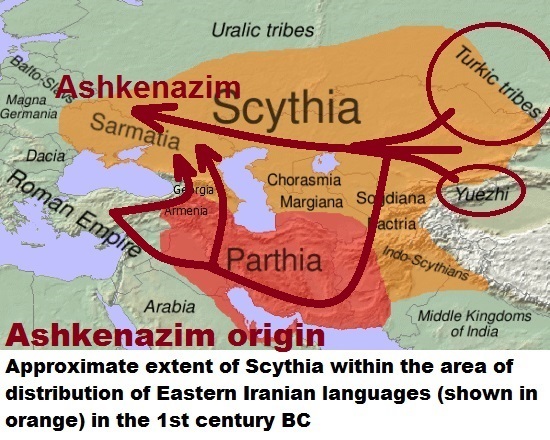 The Khazar developed very late in 750 AD compared to Turkic Mongolian raids in 1800 BC. It is unreasonable to claim that Jews are an ethnic group because Jewishness in fact is a political association that was initiated by Turkic Mongolian but very soon it became a very heterogeneous assembly due to Turkic Mongolian vast raids, excessive slavery of nations, and intensive miscegenation to breed and change their physical appearance to look like Caucasians and Europeans. 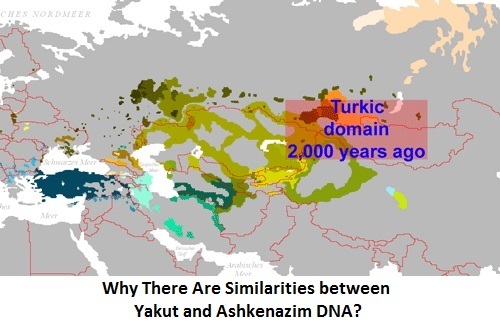 Let us first give brief definition of the Yakut then show a genetic study on their origin. Yakuts (Sakha: Саха, Sakha) are a Turkic people who mainly inhabit the Sakha Republic (Yakutia) in North East Asia. The Yakut language belongs to the Siberian branch of the Turkic languages. Yakuts mainly live in the Republic of Sakha in the Russian Federation, with some extending to the Amur, Magadan, Sakhalin regions, and the Taymyr and Evenk Autonomous Districts. Genetically the Yakuts are a hybrid population, but culturally they are Turkic. This is not a totally exceptional pattern. Ashkenazi Jews and many Latin Americans exhibit the same disjunction between genetic admixture, and relative dominance of particular cultural forms as opposed to synthesis. Part of the issue here is that biological and cultural evolution operate differently, with the latter being far more flexible and unconstrained by the inheritance modes imposed by DNA and sexual reproduction.